If you’ve been tempted by this type of high-end unit but put off by the price, Line 6 has just made it easier for you. Helix sound quality at a lower price point. Not everyone gets the ‘all-in-one’ pedalboard solution. When Line 6 brought out the original Helix in 2015, we applauded it as the most advanced floor processor we’d yet seen and a definite step up, sound-wise, from the company’s HD series. Of course, at its asking price of over a grand, the Helix was never going to be something that every guitarist could own. 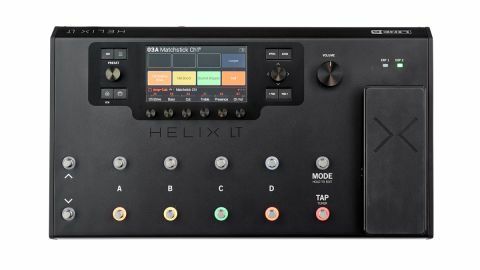 Now, Line 6 is seeking a wider audience for its HX modelling by introducing a more affordable version, the Helix LT, which comes in at around three quarters of the price. Obviously, certain facilities have had to be sacrificed to make the necessary cost savings in this iteration, but the designers seem to be right on the ball in focusing on and retaining the essentials. The LT is certainly lighter than its older sibling by just over a kilogram, presumably as a result of a bent steel chassis rather than the extruded aluminium of the original. It’s also slightly less wide than the original. The main difference, visually, is that the small LCD scribble strips below the footswitches have gone to be replaced by a ‘Performance View’ in the main display screen, which shows the current functions of each footswitch. Also, where the Helix provided separate knobs for headphone volume and overall output, the LT settles on one large knob. More changes are evident on the back panel of the unit, where input options have been reduced to a single guitar input with no sign of the aux and XLR mic inputs, something that may be disappointing for any players wanting to use the USB 8in/8out audio interface capability for line level or mic signals. Also gone are the CV output, dedicated external amp switching and S/PDIF digital connections, although external amp switching is possible through the single expression pedal socket (down from two). External connection facilities are also halved here, with just two send and return loops to incorporate external effects in the signal chain, although that should be sufficient for most players to add a couple of favourite stompboxes, which can then be used as part of a preset. Its chassis may be different, but the LT’s physical character doesn’t seem to have been compromised. It still has a build quality that instils confidence, and the easy footswitching functionality of its big brother has been retained - each of the 12 footswitches still sits in the centre of a colour-coded LED ring that shows its status, and while the scribble strips were very useful in letting you see what each is assigned to, the colour-coded performance view is an adequate substitute. There’s instant switching between two modes for the footswitches - Preset and Stomp - so you can recall presets or toggle effects on and off. The only difference with this new version is that Stomp mode is limited to eight effects footswitches, rather than the 10 of the original. In a way, the LT is more impressive in terms of its onboard sonic flexibility than the original Helix was at launch, due to a recent firmware upgrade that saw all Helix models get 62 amps, 37 cabs, 16 mics and 104 effects. As with the other Helix models, these can be used in a myriad of ways, because the 1,024 presets feature four stereo signal paths with various routing options, including the possibility of utilising 32 effects blocks. And if you’re aware of the Helix, you’ll know that the sound quality and the sheer range of tones on offer here is extremely impressive. Okay, so the LT may have lost some of the functionality of its bigger, more expensive sibling, but it still has the exact same sound and easy operation, which includes quick and intuitive editing directly from the front panel or the computer-based software editor. Would you miss some of those original functions? Well, for most users, probably not: there’s very little expunged that makes the LT less potent for live use, that is unless the two extra send and returns and a third expression pedal are a deal-breaker for you. Now let’s get down to the thorny issue of the price. More affordable than the Helix it may be, but a little more than £900 is still a lot of money to shell out on a single item of gear - and we know that there will be many players out there who could/would just not entertain the possibility of owning one. But the real question is, does it offer value for money? And to that, we’d have to answer yes. Here’s why. Disregarding the amp simulations and recording/practicing facilities, let’s purely look at the effects and compare it with a typical pedalboard. By the time you’ve amassed your collection of pedals, sought out a ’board to mount them on, invested in a multi-outlet power supply that won’t run out of juice to keep them functioning, and put together a collection of cables at the exact length to keep it all neat and tidy, it’s highly likely that you’d be reasonably close to that figure, if not way in excess of it. Of course, a conventional pedalboard is a labour of love to some players and can be put together over a period of time, spreading the cost, plus you do get to pick, choose and swap your favourite pedals as you go. However, that needs to be balanced against the sheer amount of sounds and the switching/routing flexibility of the Helix LT, not to mention that it’s probably more easily portable and less messy.